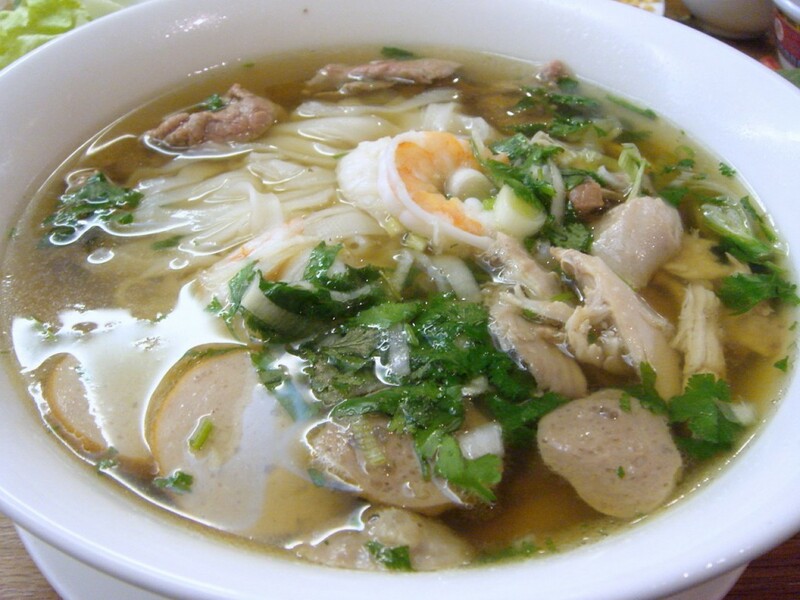 As the name suggests, Viet Noodle Bar is a Vietnamese noodle bar. It’s a small space with simple furnishings, a no-frills approach and, as already mentioned, super-speedy service. Within five minutes of placing our order, we were served our first starter of goi (£5.50), a salad with an abundance of finely sliced prawns, julienned vegetables and rau ram (Vietnamese coriander). With that special Vietnamese fish sauce, the salad proved a treat. Deliciously fresh with crunchy vegetables, it melded wonderfully with the aroma of the herbs and the sweetness of the sauce. Now for guilty confession number two. With cheap pricing such as is the case at Viet Noodle Bar, about £5.50 to £6.50 for mains and less for starters, I couldn’t help but over-order and then overeat. Given the portion sizes, one main each would have done just fine. A starter to share was great for adding that little bit of variety and extra flavour, but two starters? A plate of cha gio, crispy spring rolls, had just been placed on the table next to us. Despite having already ordered, as usual I was unable to exercise restraint and I waved the waiter down to order some cha goi myself. The spring rolls too turned up in no time, hot from the fryer. However, I found the rice paper wrapping to be too thick, as if it’d been wrapped too many times over. It was also low in pork and prawn content, the lack of which was compensated by a heavy fill of vermicelli noodles instead. I moved onto my main, the special phở noodles (£5.50), special as it contained a combination of chicken, beef, meatballs and prawns, and not just one type of meat filling. As the food was served so quickly, I’d not quite finished the starters yet, so I ended up eating both my starters and my main simultaneously. But in Oriental dining this is fine to do as food is served when ready, and eaten when served. But back to the description of the phở noodles. (Sorry, for jumping all over the place with my descriptions. I was trying to keep up with J and the goings on, and my mind just simply raced away). The soup was of that deep chicken stock flavour, the rice noodles were of the requisite width and lightness, and the meat and prawns underlying the dish were plentiful enough to make it deeply satisfying. The dishes at Viet Noodle Bar are not limited to just noodle dishes. J had settled on a rice main of com bi cha thit nuong (£6.50), with pork served three ways (shredded, char-grilled with lemongrass and a pork cake). It was tantalisingly yummy when the flavours of all three were eaten in conjunction with the sweetness of the special fish sauce. Curiously though, there were also Thai options on the menu. We finished our meal and J had to head back to the office so she could deal with some lawyer or another. But there was time for a quick summary before she went. We both agreed that the food was on the whole quite good, authentic and incredible value for money. And for that busy business lunchtime crowd it’s just perfect, especially as the turnaround was so fast. And then, in a jiffy, J was gone. Pho and Cha goi are absolutely my favorite Vietnamese foods! The one I like the most is Pho with thinly sliced medium rare beef. I didn’t know that the fried spring rolls are called Cha goi. They call it imperial rolls in many restaurants around where I live. I love pho too! The best I had was at this little street hawker in Hanoi. Medium rare beef sounds yummy but I just love, love, love prawms so always go for those. Yes, cha goi is what Viet Noodle Bar called their spring rolls. You’re on my links page now! Thanks for adding me to your blog. 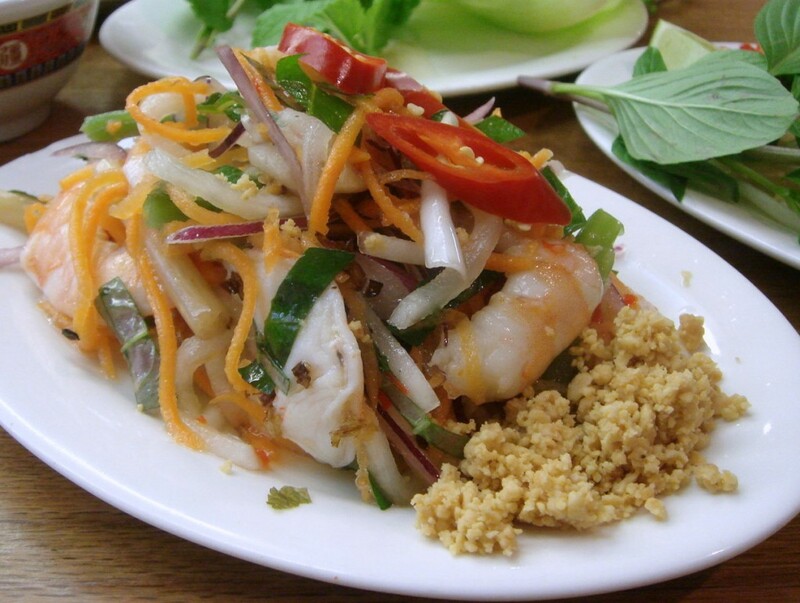 That truly is a great looking Prawn Salad. And it was really yummy too! Dear J, it is always fun to eat with you! Where shall we head to next? Somewhere girlie! Girls have to eat after all! 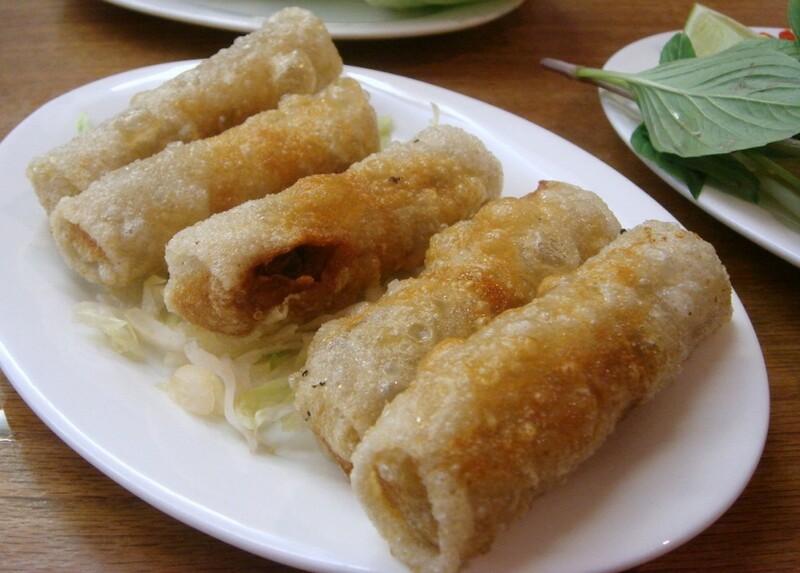 The cha gio (southern Viet) or nem (northern viet) in your pic were frozen after being rolled and then dumped in the frier semi frozen when you ordered, that could explain why they weren’t so top notch. You can tell that they were frozen by the way the rice paper has bubbled to the degree that it has done! Glad the rest of the food was good though! Yes I think you’re right! If they were semi-frozen, there would have been too much moister in the rolls which would have caused them not to crisp properly. Thanks for that great insight. I always am curious as to find out what has led to things going wrong. It helps me with my cooking! Thanks for visiting. I hope you come again soon. i am having them right now and i am in total BLISS.